My leg might not be all that attractive but by golly the ankle bracelet is super cute! Mine is the top bracelet! She did a great job and I love it. 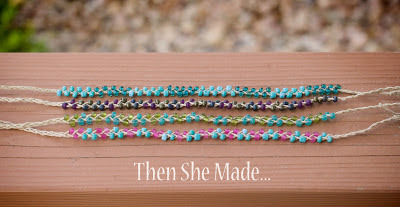 So, do you have seed beads and hemp chord? Yes? 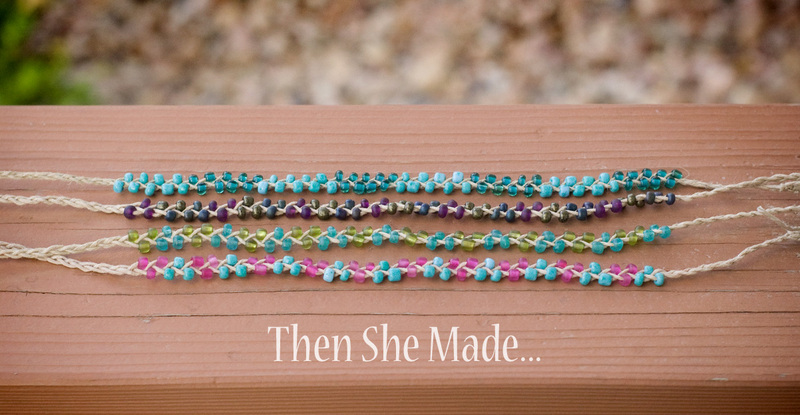 Well, good news, that is pretty much all you need to make these bracelets. A safety pin would be helpful too but it's not really needed. 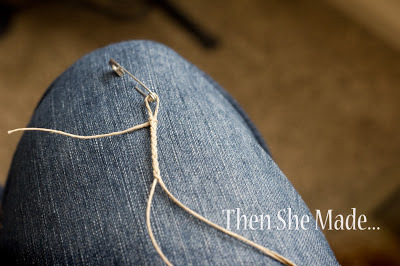 So, basically what you do is this... take three fairly long strings of hemp twine and make a loop near one end. Then tie it off in a knot. (see the small knot just under the loop in the photo above?) 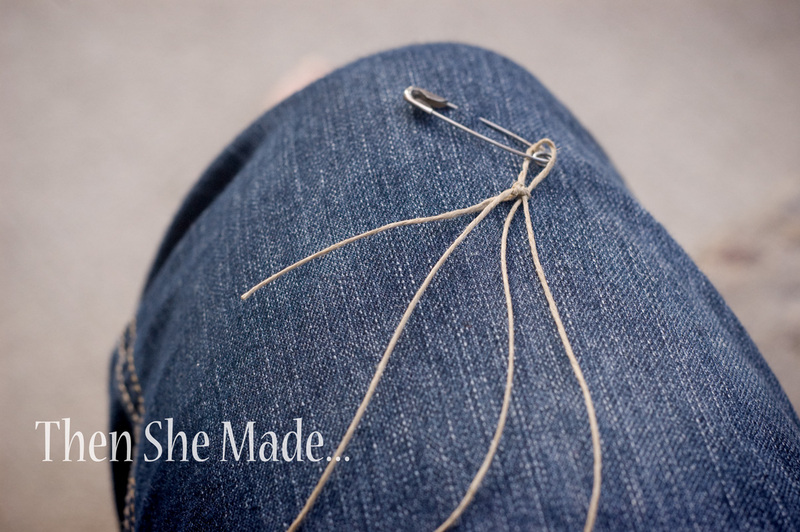 Then hook the loop through the safety pin and pin the pin to your pants. 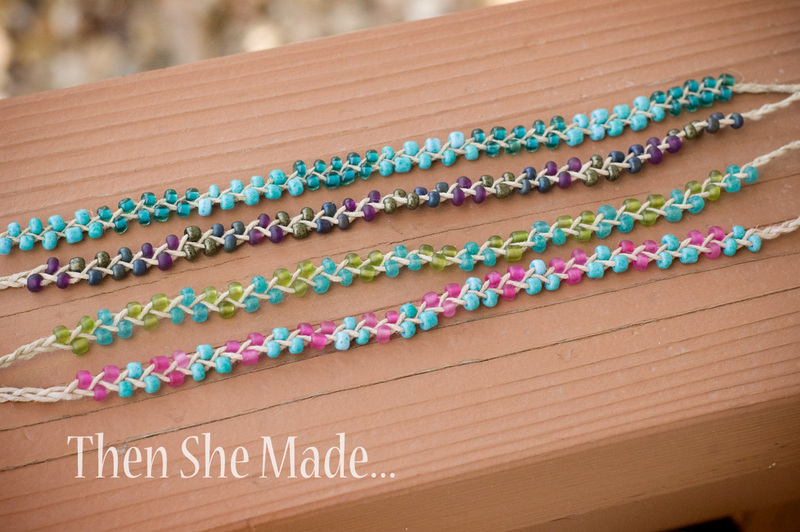 Next, just braid your twine. It should be braided about an inch to an inch and a half down from the base of the loop. 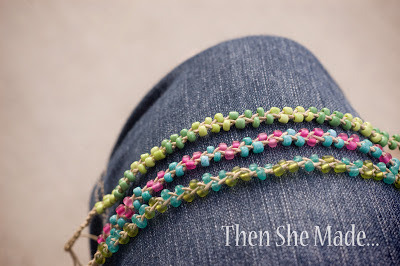 Then add about 20 beads to each of the three strings and continue to braid. As you cross one string over the other, push up a bead. Then keep repeating until all your beads are braided in place. 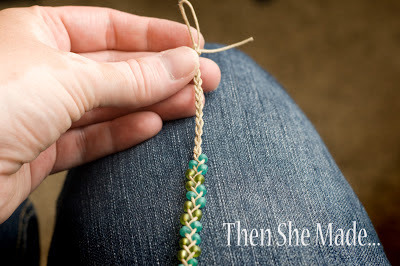 After you are done adding the beads just continue to braid the twine for another inch or so and then tie a knot on the end. So there you have it - super cute and really easy. It's also a fun project for kids to make and is pretty easy to do in the car while traveling. Well, that's as long as your beads don't spill - eek! That would be bad. Miss M does all the prep work ahead of time. She cuts her strings and ties them together, then she adds on her beads to each strings and knots the individual ends of the strings so they don't fall off. 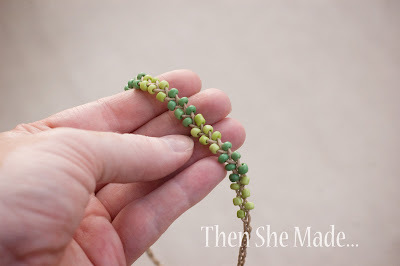 Then she tucks them into her purse and pulls them out when she needs something to do and, because she has everything already put together, she doesn't have to worry about taking along beads or anything else and nothing spills. She really has a great little system. Smart kid! There are a lot of great tutorials in blogland on how to make these and some of them have some fun variations like finishing them with button claps and using different materials in place of the beads. If you want more info here's a site that has a great tutorial worth checking out. Thanks for the link! 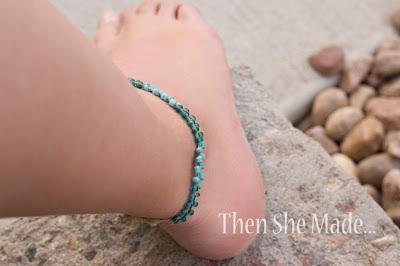 Beautiful bracelets and anklets, Miss M.
I have never attempted to take a picture of my own ankle but I imagine that it is pretty entertaining to try. Your anklet looks so cute. This looks crazy simple to make. Thanks for giving us the details. Your Miss M is one smart cookie.